Tablet Tumblers are made collaboratively by Kristin Lucas and Joe McKay under the collective name Electric Donut. 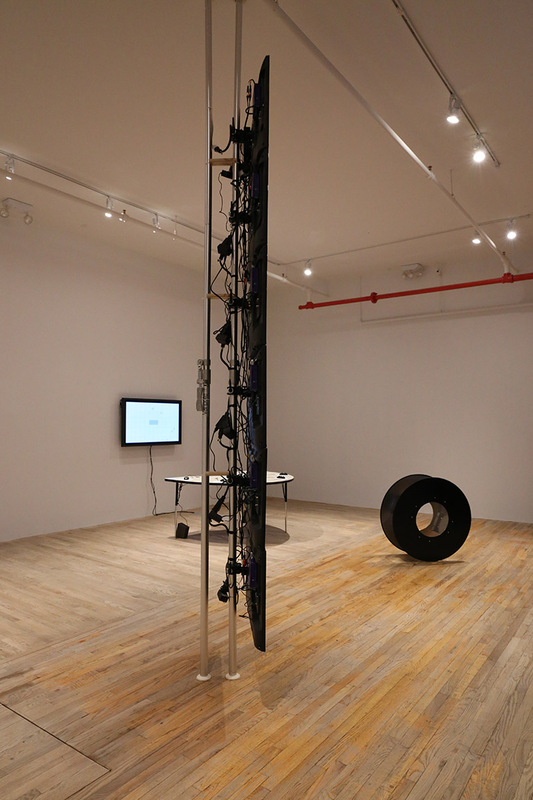 "Kristin Lucas and Joe McKay: Away From Keyboard", 2015; Postmasters, New York. An object outfitted with mobile computing tablets functions as a multiple-camera recording device utilizing the tablets' built-in cameras. 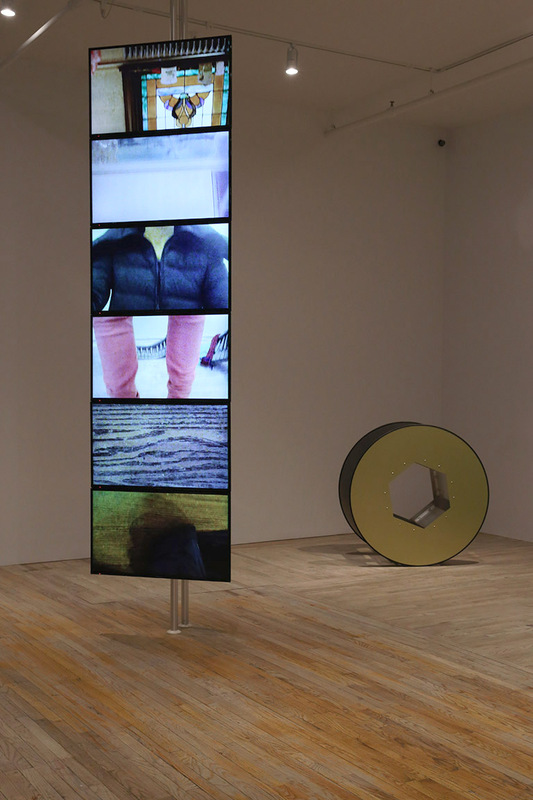 Recordings are presented as a continuous six-channel rolling point of view video that roll cuts from one New York City-area living space to the next. Participants navigate the tumbler through their own spaces and are given latitude for personal expression. Unlike traditional mapping services, the tumbler records its surroundings through a method of chance operation. 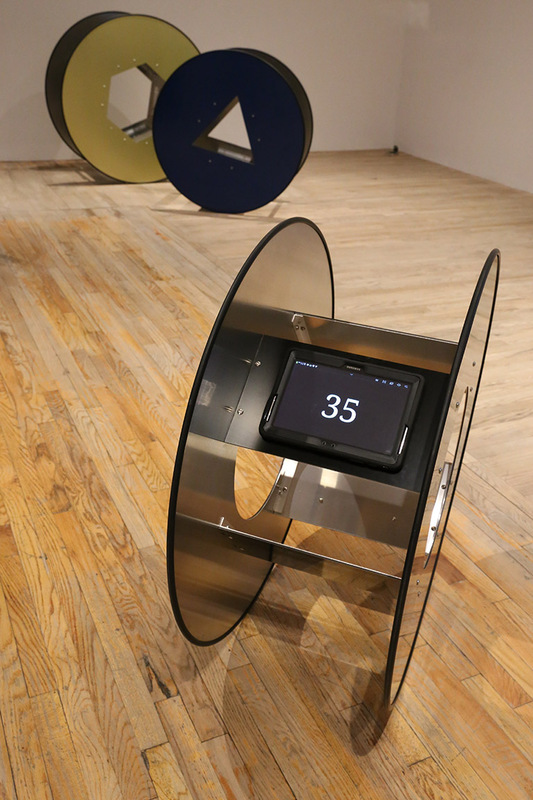 Tablet Tumbler: Martian Sol Cycle, 2015 (left); Tablet Tumbler: PlusPlus, 2015 (right) Postmasters, New York; Dec 11, 2015 - Jan 23, 2016. Visualizes a full day of the sky as seen from Mars. The view rotates on Martian time. Ecstatic about increments. The title "PlusPlus" is derived from programming languages. The operator "++" is used to represent a variable's increase in value. Interaction draws a red line on Google Maps. Small movements produce larger than life scribbles. Plays with impact scale. The design of the Tablet Tumbler object has many human-engineered technological references, including the wheel which allowed for mechanized systems, the cable drum which is used to lay communication wires across land and sea, and the Google Street View car. 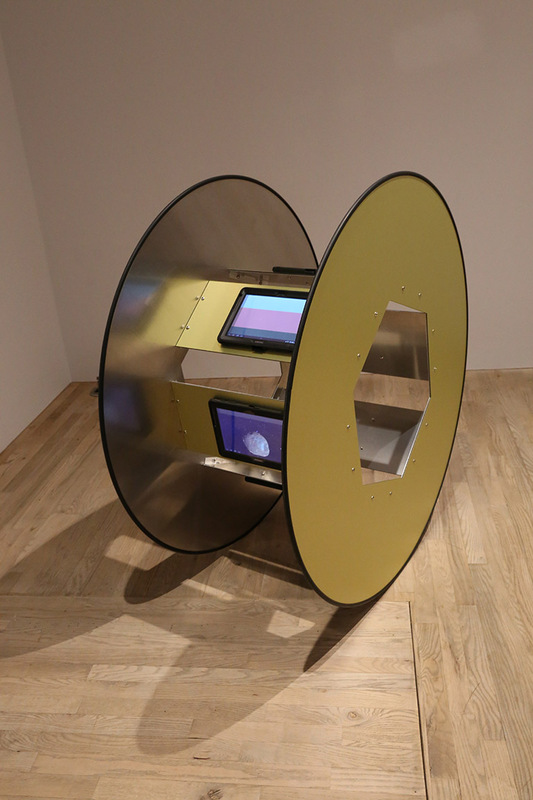 Cyclical and cinematic references include the pre‐cinema zoetrope, film loop, animated GIF, and programmed computer routine. Considering that interaction with the object requires human will and physical power, there is a playful connection to the story of Sisyphus who is compelled to push a rock up a hill over and again. There is also a mythical connection to the recent Japanese video game Katamari Damacy in which users participate in a narrative by pushing a magical adhesive ball around the city and its surroundings, collecting increasingly larger objects from thumb tacks to people to airplanes to mountains until it the ball is large enough to form a star. From yet another point of view in our fast-changing world of technological innovation, the Tablet Tumbler object can be seen as tumbleweed of aging technology. Credits: The Tablet Tumbler series was produced with the support of Eyebeam, Foundation for Contemporary Arts (FCA), Blue House Design, SUNY Purchase College, and The University of Texas at Austin College of Fine Arts.